Today, we provide a bicycle lamp in front of a manufacturer, we have not yet been listed in the magazine, Büchel. The focus is on the headlights Büchel Vancouver and the 3D Lite taillight, of course FR approvals. As always, we look at the manufacturer’s instructions to the burn time, charging time, and the assembly to the bicycle. Delivery is everything you need for the correct operation of the headlight and taillight. Both lamps have built-in lithium ion batteries. With this, a power adapter and a USB charging cable which allows you to charge both the LED bicycle lamp and taillight. Also in this case SET, the brackets for mounting the bicycle. The processing of the materials used works well, there are no spray nose over and there are no sharp edges. The USB charger plug is plugged into the lamp down. The socket is closed to me a rubber cap and must be opened prior to loading. On the top you will find a control LED and an on-off switch. 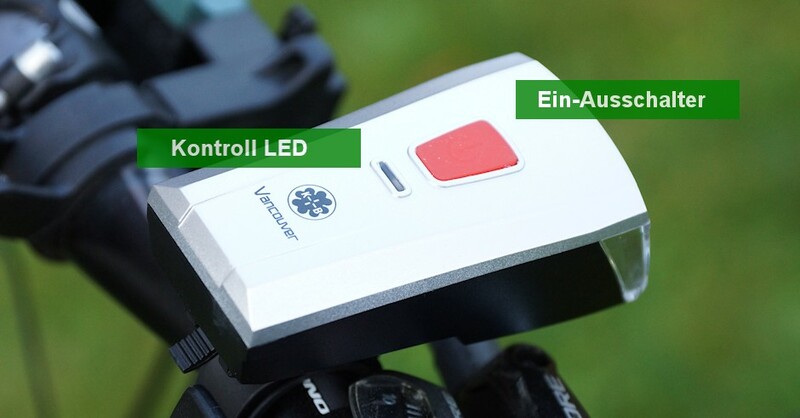 With this switch you change the bicycle headlight between the three levels of brightness, the taillight this is a simple on-off switch. All components can be by rainwater. We leave the bike for the test in the rain one day. 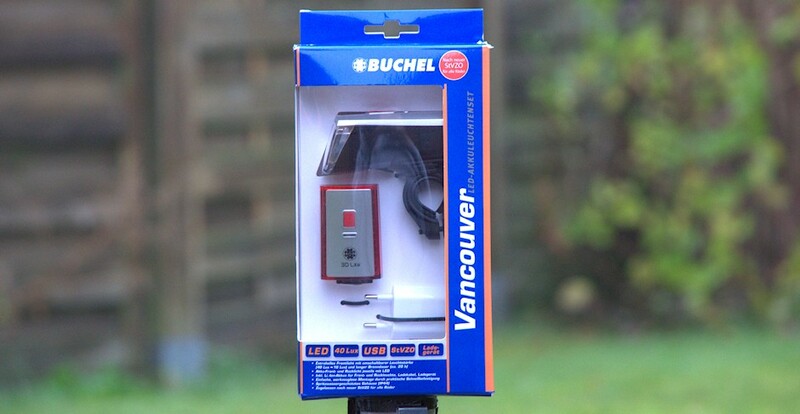 According to the manufacturer Büchel manages the battery LED bicycle headlight 40 Lux in the lightest and 10 lux at the lowest level. In between, there is a setting in which the fixture creates 20 Lux. The LED has a rated power of 1 Watt and lights according to the manufacturer in 40 LUX 300 minutes (5 hours), with 20 Lux approximately 600 minutes (10 hours) and with the lowest level (10 lux) 1,200 minutes this represents 20 hours. The charging time of the bicycle headlight is approximately 5.5 to 6 hours. The taillight is to have a rated power of 0.2 watts and a burn time of 900 minutes. 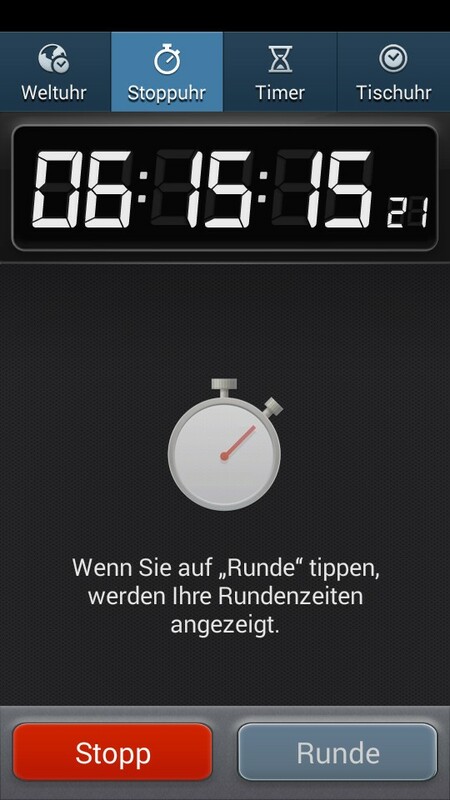 The charging time is approximately 2-2.5 hours. The 3D Lite taillight wieg only 32 grams, the headlamp weighs just 93 grams. 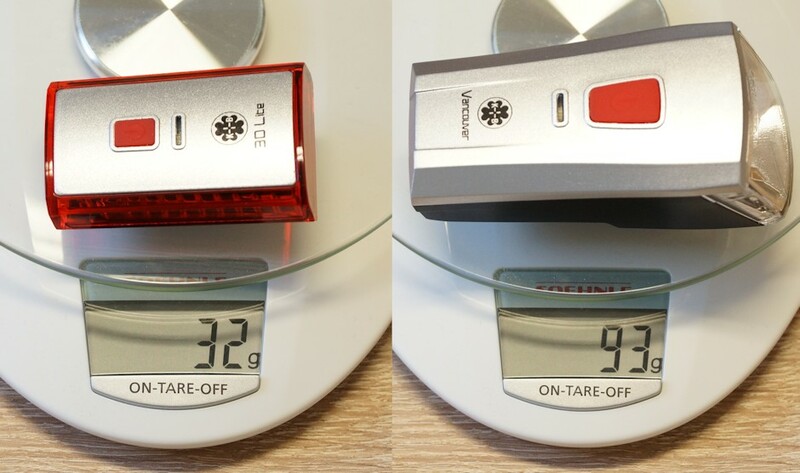 The Lamp Set weighs without brackets only 125 grams and does not need to hide. For comparison, theTrelock LS 450 /320 Set together weighs 164 grams. 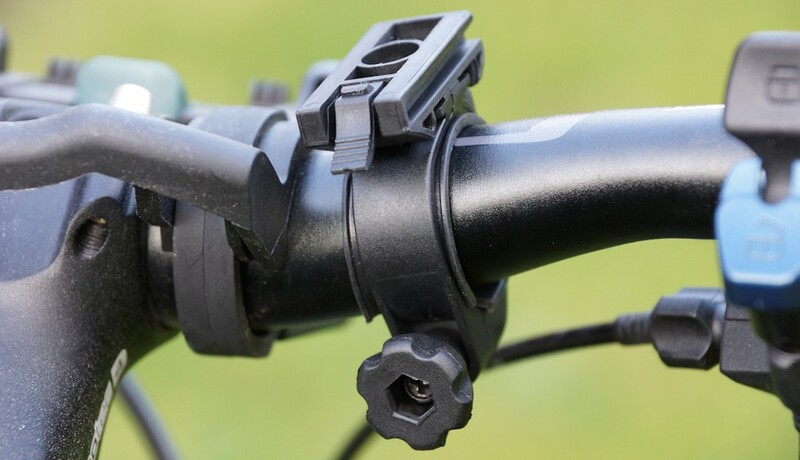 Similar to the Cateye Econom Force also the holder for the Büchel Vancouver bicycle lamp is mounted using quick fastening on the handlebar. The installation can be fully carried out without tools. For this purpose the holder is slightly pressed and placed around the handlebar. Depending on the handlebars must (attached in 3 different size) can be used here with a spacer. To load one has to solve the spotlight out of its holder. The works very simply.Do this by pressing the lever and pull the lamp smoothly forward. 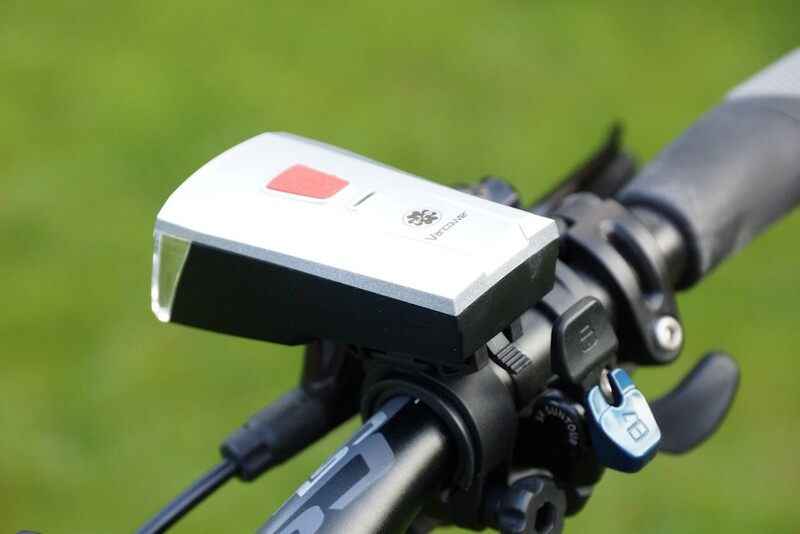 The charging socket is located entertaining the headlight and is protected by a rubber cover.The 3D Lite rear light is mounted to a bracket on the seat post. This bracket remains permanently on bike. Given the mounting is fixed with a rubber strap. The lamp itself can be fixed with a screw and so also achieved by hand and removed (eg for loading). The screw head is equipped with an easy-grip knob. The possibility of the rear light easy to solve, the charging of the internal battery is a problem. The Büchel Vancouver makes a good impression, but offers a modern design. The headlamp is so designed that emits no light at the sides. This leads to point deduction. It would be quite desirable to be from the side is already apparent. However pluses collects the lamp at the battery life, here the manufacturer’s instructions were clearly exceeded. could score Eben case, the SET with the simple assembly to the bicycle. Not only the brackets are easy to install, also attached to the lamp or in the holder presents no problems. Total gets the Battery headlight from us 4.6 out of 5 points. He achieved a rating of «Very Good».